The nearest ocean to Berlin is over 200km away — and North Sea beaches aren’t known for Caribbean weather and rum drinks. 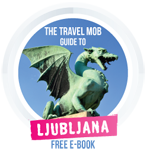 But Berliners pay no heed to obvious geographical stereotypes. Give them a stretch of water and truckloads of sand, mix in some beach chairs, reggae music and a ramshackle driftwood bar, and then garnish with some garish Hawaiian shirts and over-sized sunglasses, and you have the perfect contrast of a tropical beach environs amid a sprawling, concrete city. 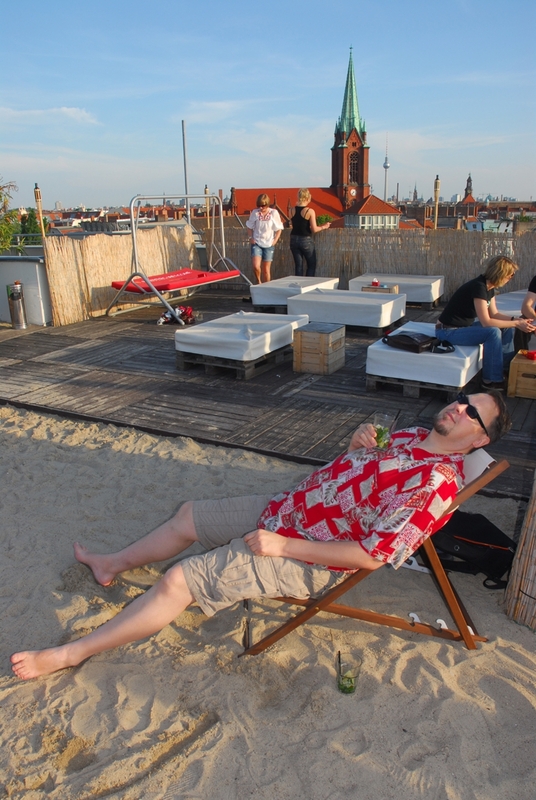 In fact, so many beach bars have sprung up in Berlin in the past few years that there is room to diversify. 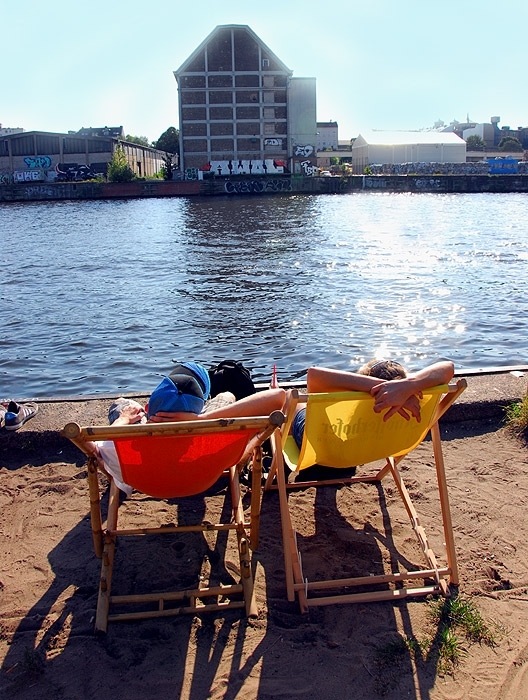 You can ‘hit the beach’ almost anywhere in Berlin: by the river, astride a canal or even high up on a rooftop. Hell, you can even drag your luggage directly from Berlin Hauptbahnhof (main train station) onto a beach bar a few metres away. Why beach bars in a landlocked city? Is it the Berliner way of compensation for nine months of drab, dreary weather? Or is it a cheap ‘staycation’ alternative for the many student/artist/unemployed types who can’t afford actual beach holidays? My task isn’t to answer these burning philosophical questions. My job is to pack my bucket and spade, and enjoy a few drinks on some of the best stretches of sand in the city (and let me tell ya, brothers and sisters: I love my job). Berliners pay no heed to obvious geographical stereotypes. Give them a stretch of water and truckloads of sand, mix in some beach chairs, reggae music and a ramshackle driftwood bar… and you have the perfect contrast of a tropical beach environs amid a sprawling, concrete city. My beachcomber day began at 3pm on a sunny Saturday in September, a few steps from Ostbahnhof train station in East Berlin. The station overlooks the River Spree and the East Side Gallery, a 1km section of the original Berliner Mauer (Berlin Wall), famous tourist landmark and concrete paint receptacle to the graffiti all-stars. If you cross the street from the station and go left on Mühlenstrasse, you will follow the wall and the tourists and no doubt hate yourself the next day. Instead, do as I did, and veer right into the hole in the wall with the word ‘YAAM’ spray-painted outside. As always in Berlin, the best things are poorly marked, with dodgy entries into half-verboten industrial spaces. 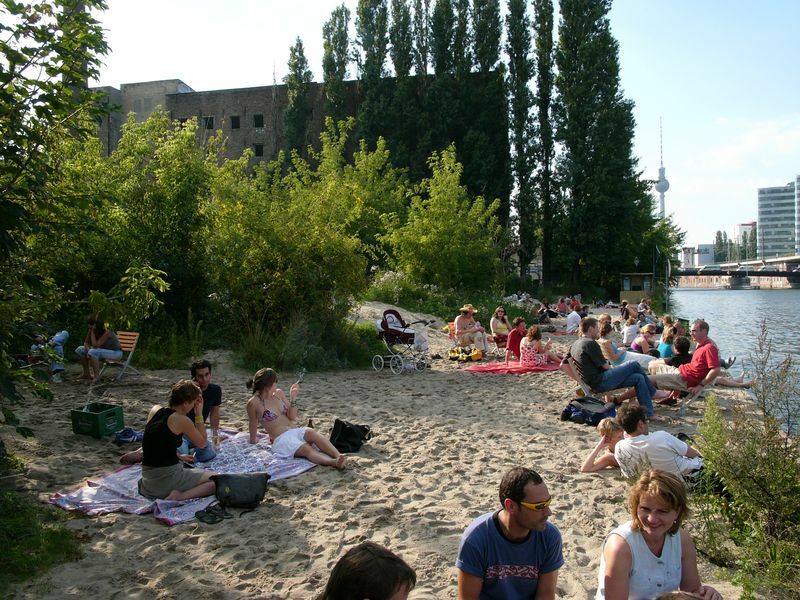 This is the perfect place to begin your beach bar journey on the River Spree, which cuts through the East Berlin district of Friedrichshain and its Western sister, Kreuzberg. YAAM (Stralauerplatz 35, www.yaam.de) stands for Youth African Art Market, though market is not the right word. It is a beach bar proper. Just let the nice man at the entrance check your backpack and break on through to the other side. Don’t worry, he’s not checking for weapons of mass destruction. It is his job to keep cheap-asses from smuggling their own beverages in to avoid buying drinks at the bar. You may hear the term ‘multi-kulti’ bantered about in regards to Berlin, but YAAM is the real deal. Jamaican grooves on the stereo, Jamaican and African beer at the bar. I’m informed by Max Weber, YAAM manager (and bearer of the same name as a famous German philosopher) that YAAM is not just another Berlin beach bar, but much more. It is a community centre for multi-cultural youth which hosts arts and crafts, sports and training and a myriad of other activities for young people. Right on cue, Max introduced me to a man who teaches children’s boxing on the premises. 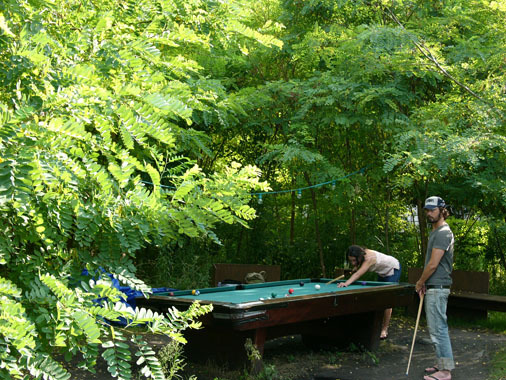 “People in Berlin with kids who couldn’t go to parties came here,” Max explained. “So we have a place for families to eat and play during the day and music and parties at night.” Music varies from Jamaican reggae to African beats to American and European hip hop. The list of YAAM’s past musical performers is impressive, including such notables as Ice Cube and Grand Master Flash. People were playing beach volleyball while children crawled on blankets to their nearby lunch. A group of English-speaking lads at the bar ordered loudly. 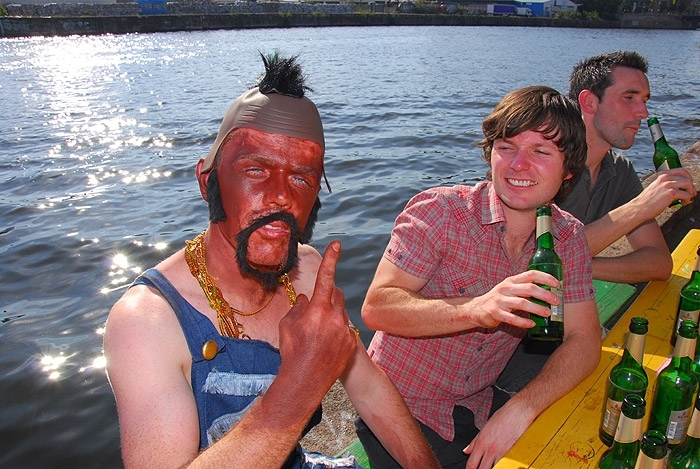 One of them was (loosely) dressed as Mr. T. The obvious British Stag tour was content to guzzle their beer down by the concrete shore. One of them waxed poetic in pidgin German about the size and quality of a nearby girl’s breasts. Water lapped onto the stony embankment and couples in beach chairs basked in the sun with a view of abandoned factories looming large on the opposite shore. On the opposite side of the river to YAAM is the uberhip West Berlin district of Kreuzberg (click the link for our “In The Zone” guide!). This district is so punk rock, so cool, so wannabe anarchy that they even have a day of destruction each year on May 1st. They turn over cars, throw Molotov cocktails at cops and generally get their asses kicked in return. On this sunny September day I picked my way carefully down the Koepenickerstrasse which leads to the (predictably) poorly marked entrance of Kiki Blofeld beach bar (Köpenickerstrasse 48/49, www.kikiblofeld.de). Kiki Blofeld’s flagship is a former DDR police boat dock converted into a night club. This is closed during the day, but for 1 euro you can walk into the grounds. After being told that the first bar is nicht offen I headed to the second, only to be shocked at the uberexpensive cocktails (8-9 euros? Out of their friggin’ minds) and grabbed a beer instead. After a perusal around beach bar’s groovy grounds, complete with mini glass chandeliers hanging from trees over ping pong tables, a pool table, and abandoned squat furniture, I decided to make my way down to the concrete shore. Just as in YAAM, the imported beach sand gently slopes down to a sudden drop into the river. I slid down with sand spraying into the water under my bulk. I grabbed the end of a wooden palette which was fashioned into a beach chair. I did it: my foot actually touched cold, dark, polluted water. Satisfied, I leaned back on the splintery palette beach chair, listened to the waves of a boat wake breaking on the concrete below, watched the tour boats gliding by and drank my beer on a rare sunny Berlin day. “Drink Jager-Energy!! !” the large, inebriated German shouted at me. I gave him my favourite thumbs-up-and-winking-grin move which deflects 90% of all drunken louts and leaned over the bar.There was in fact a machine which dispensed straight shots of Jagermeister. A thin, shirtless blur of tattoos moved between Jagermeister tap and Red Bull dispensary. They’re not just whistling Dixie at Licht Park (Light Park, Michaelkirchstraße 22-23). They go directly to the party jugular. At 6pm in the waning daylight, a dance party was in full effect. Well, more of a shambling, post-Friday-night-party-til-Saturday-afternoon dance-trance zombie-shuffle, to be precise. The scene of disco dancing, quivering arms and sliding feet struck the right balance on the fine line between pathetic and cool. The crowd was mostly 20-somethings with a smattering of 30s. I found the other middle-aged man in the crowd and asked him what he thought of Licht Park. “This place has the best looking girls of all the beach bars in Berlin,” said Paul. Well, there you have it, middle-aged dudes. Ooze on over and ogle away. I’d be remiss if I didn’t mention the gentrification problem. Berlin has more square footage of abandoned lots, disused factories and empty spaces than almost anywhere in Europe. However, the efforts of the creative communities of Berlin to rejuvenate and renovate these spaces face constant threat by investment bankers hovering for the leveraged buyouts. Kiki Blofeld is closing soon. I tried to get a word from the owner/manager, but he was just too damn busy retiring to speak to me. Perhaps he was one of the lucky ones who were merely bought out. YAAM is another story. Max Weber told me that in spite of all of their efforts to build a thriving community which serves the families of Berlin, banks are lining up to bid on their riverfront property. Max explained that they have no formal contract—that they formed the community from scratch in an empty space with a handshake deal. But that doesn’t work in the business world of suits vs. Bermuda shorts. Because, after all, we need more yuppie loft apartments and fewer beach bars. Well, I learned one thing from all of this. This Berlin beach bum ain’t goin’ down with out a fight. They can have my Mai Tai when they pry it from my cold, dead hand. Set on the lofty environs of the upper parking deck of Prenzlauer Berg‘s shopping mall, you won’t be able to dip your toes in the water at Deck 5, but the views are a big draw, especially at sunset. White sofas, deckchairs and Balearic beats give it an Ibiza lounge bar vibe, although this might be disturbed if there’s a Bundesliga match to be screened. Arguably the closest you’ll get to imitating a summer holiday in Berlin, the main attraction of Badeschiff (German for ‘bathing ship’) is the 32 x 8m swimming pool converted from the hull of a cargo boat. 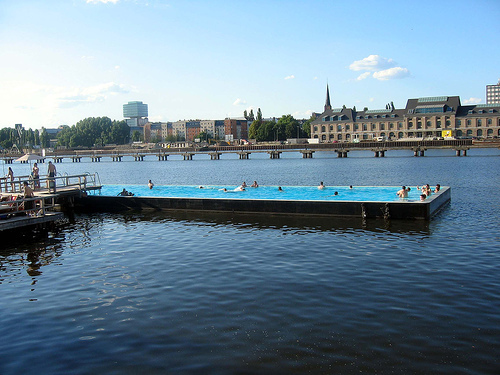 This sanitary and warm (24 celsius) pool floats on the river Spree, so if kicking back with a Pina Colada isn’t enough for you, then grab your speedos and head on down. Open ’til midnight and, being a Berlin cultural project, there’s also the usual array of live music, DJs and events – plus of course grill and bar – to keep you busy. On a tiny canal on Schlesische Strasse this hip little joint has dispensed with that gritty yellow stuff that ruins an otherwise pleasant sunbathing session, providing instead a rather civilised wooden terrace for sinking a beer and enjoying a slice of pizza. Many however choose to go one step further, perching on floating decks and dangling their footsies into the water as they wave for waitress service. By night DJs spin underground sounds. Possibly the most easily accessible of all of Berlin’s beach bars, if the idea of either baring your body or in any way trying to be cool frightens you, then consider this centrally located bar a gentle introduction to the scene. Situated right behind Museumsinsel, day-trippers can follow up a morning of culture with an afternoon dose of deckchair therapy and nod at the tourists floating by on their sightseeing cruises. That’s not all folks! Don’t forget to head over to our Berlin city break guide for lots more tips. Or else find every story we’ve ever written about the German capital right here. Craig Robinson is an American refugee who has lived in Europe for more than 15 years, including London, Dublin, Prague and now Berlin. Craig is a writer and professional photographer who dabbles in web design, when not lamenting the effect of gentrification on his favourite cities.